Through electronic serendipity I was reunited (on-line) with a high school friend. We had both moved and lost touch in the way back. Thought I’d seen his name in a Time Magazine article, flying Special Forces missions in the first gulf war. Many years later I find he retired as a bird colonel and was large and in charge of Air Force Special Operations at Hurlburt(AFSOC). It takes a good deal of effort to rate O-6 with that sort of responsibility. He was a smart guy and driven to achieve but I never suspected that he’d be in that career path. Great to hear from you . That was me back in the first war I started flying search and rescue helicopters, was an instructor at the school house in Albuquerque, took a short staff tour at the Pentagon, went through fixed-wing transition (not a fun thing to pull those G’s with frustrated fighter pilots for instructors) then went into special operations. I was the Operations Group Commander for all SOF aircraft in the AF (had 11 squadrons) so I got checked out in the AC-130 gunship, the Talon II, and flew some soviet stuff. How cool is that? While I’m proud of the path I’d chosen, I’d love to hear his operational flying stories in the Pave Low. Some of his adventures are featured in Shadow Warriors and The Commandos. 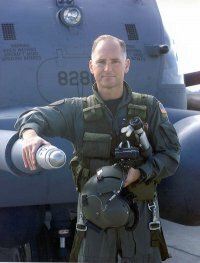 He later served as Operations Group Commander of AFSOC during the time of the famous Horse Soldiers with 94 aircraft and 1,400 Airmen under his auspices. There’s probably a good narrative behind “flew some Soviet Stuff”, like why was the U.S. flying Russian MI-8’s? For both of us, it all sort of worked out with careers and families. However, Bob still gets to play with some cool toys. BZ Bob. Dinner’s on me when I make it to Florida. Your guy seems to be a classic example of Special Ops types being so stove-piped that they don’t have enough breadth of experience in other commands/ops to be considered for Flag rank. That was why the Special ops joint Command was created in the first place–to provide enough critical mass that a major command implies to justify promoting people to flag-rank out of it. Sounds like an interesting career to say the least. Who knows, if I hadn’t gone back to F-4s after my FAC experience I might have stayed in the Special Ops field and stayed in the AF (If they would have tolerated me 🙂 ) as I always enjoyed the Special Ops side of the house. (sigh) The road not taken…..but then I would have never met my wife of 37 yrs, etc., so one just never knows…..
I’ve just finished a riveting account of FAC missions in Laos: “Here there are Tigers”. Special Ops in the O-2 flown by Maj Reginald Hathorn also known as Nail 31. Survival involved equal parts talent and luck in very large quantities. Unlike you, Hathorn did not volunteer for FAC duty. He hoped for fast movers after accumulating 4,000 hours in fighters and bombers. Instead he got the Skymaster, although later moved to Spec Ops flying. Transitioning back to F-4’s may have increased your life span. A career can be defined by incremental steps but many times it hinges on one or two important choices.